The band of persistent and locally heavy rain will continue to clear northwards this afternoon as sunny spells follow with scattered showers. Highest temperatures 6 to 11 degrees. A risk of some thunderstorms later in the south and southeast. Clear spells tonight and scattered showers. Lowest temperatures will range 2 to 5 degrees with a slight ground frost in areas sheltered from the fresh southwest wind. Tomorrow Thursday will begin dry and sunny apart from scattered showers. However more heavy rain will spread from the Atlantic during the afternoon and evening. Highest temperatures will range 8 to 11 degrees. Becoming very windy again later as southwesterly winds strengthen throughout the day. Risk of some flooding later especially in the west and south. There is flooding on the N11 Dublin/ Wexford Rd north of the Beehive, affecting traffic in both directions. Flooding also on the Marlton Rd into Wicklow Town. Flooding southbound on the M11 Dublin /Wexford Rd at J7 Bray South. Reports of flooding on the Rathnew/ Rathdrum Rd (R752). 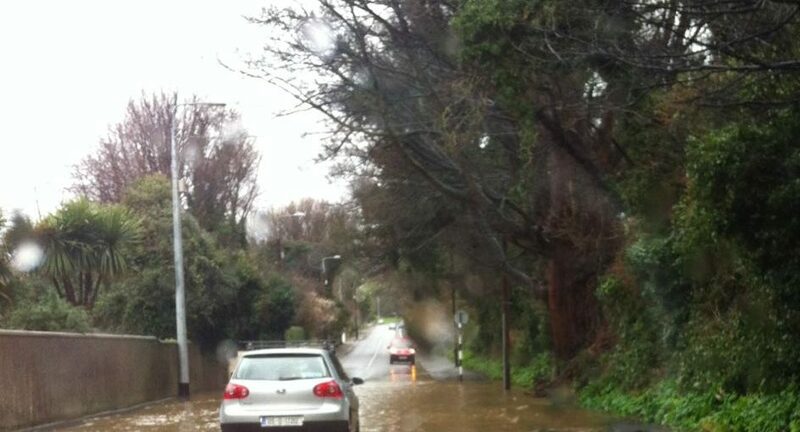 Reports of flooding on Old Connaught Ave in Bray. Reports of blizzard like conditions on Lugnaquilla this morning with snow and winds of 70kmh towards its exposed flanks. Further broken showers during daytime hours leading to low visibility. Today is a very popular day for hill walking so take care and make sure to wear correct clothing and footwear. On Sunday 29/12/13 at approx 16.46hrs Mountain Rescue were tasked by An Garda Siochana to come to the assistance of a family with a young child who had become both exhausted and soaked by heavy rainfall while on the Spinc. The Glen Team sent out a local response to assist the family and the incident was resolved by 17.15hrs. The Bray charity swim has been postponed and will now take place on St.Patrick’s day. The RNLI are advising people to keep clear of coastal paths and cliffs.